MORE THAN HALF of respondents in a new poll said they plan to vote for Hillary Clinton – the first time the Democratic presidential candidate has breached that all-important 50% threshold. The poll released today by Quinnipiac University found the former secretary of state leading Trump 51% to 41% in a head to head race. Support for Clinton falls below 50% if third-party candidates are thrown into the equation. The former first lady gets 45%, with Trump polling 38%, when Libertarian Party candidate Gary Johnson and Green Party contender Jill Stein are added to the mix. Johnson gets 10% and Stein is at 4% in the Quinnipiac poll. Trump’s campaign has stumbled in recent weeks after a series of perceived gaffes. Commentators say it has struggled to make the transition from the scrappy party nomination fight to the battle to become US commander-in-chief. “Trump’s missteps, stumbles and gaffes seem to outweigh Clinton’s shaky trust status and perceived shady dealings. “Wow, is there any light at the end of this dark and depressing chapter in American politics?” Malloy said. 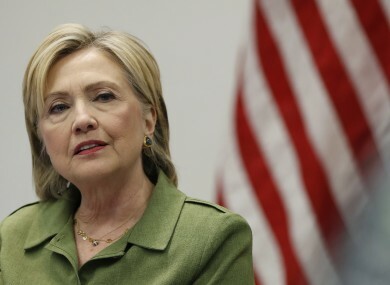 Meanwhile, Clinton, who is looking to make history as America’s first female commander-in-chief, has hit choppy waters as well amid the continuing fallout over her misbegotten decision to use a private email server for State Department correspondence. Email “Hillary Clinton has taken a huge lead in the race for the White House”. Feedback on “Hillary Clinton has taken a huge lead in the race for the White House”.